Here is the extra update chapter from the new 2013 paperback edition of Bad Pharma. It’s a fun romp through the changes that have happened over the past year or so, starring the many ethical professionals in pharma and medicine who have tried to push things forward, and some very shameful denialism from people in positions of “leadership”. There are some very interesting imperfections in medicine, they cost lives, and they can all be easily fixed, where there is common sense and good-will. 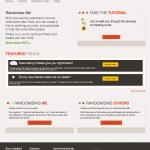 RandomiseMe: our fun new website that lets anyone design and run a randomised controlled trial.